By Lalitha Ramachandran in Visala Keralam monthly, writes:” The climate is not suitable for a beginner in writing novel. One has to cope with certain formula. They think that a story according to norms is a must. The editors of weeklies are setting the formula. It is similar to box office formula in cinema. Disregarding such formulae, Vatsala has written her first novel. She is presenting the picture of a generation who has lost values. This is the story of Rarukutty, and Sarasu. A compound family lives through the memoirs of these two characters. Rarukutty’s life is full of worries. These kinds of people are rare among the crores of people. He is the embodiment of forgiveness and mental strength. The family consists of twenty one members. Sarasu, the young daughter wanted to study in the city And she goes. She wanted to leave the breathe less house hold. A new rich man, one of the family members came back from Singapore with a lot of money and he decides to purchase the outright rites of the family house. This was bad luck for all others who have to leave their home. The story begins from here. 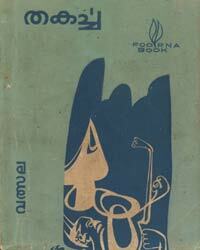 The author can be proud of her very first novel..” June, 1969.